I was born in Thabazimbi, in the Northern Province of South Africa, in 1952. I qualified as a medical doctor at Pretoria University and am still in part time practice. I ground my first knife, a dagger, in 1979 from a fully hardened file on a back yard bench grinder and shaped the handle on an electric hand drill. After completing a few of these as presents to my friends, I decided my other hobbies like model ship building and fishing were much more fun. 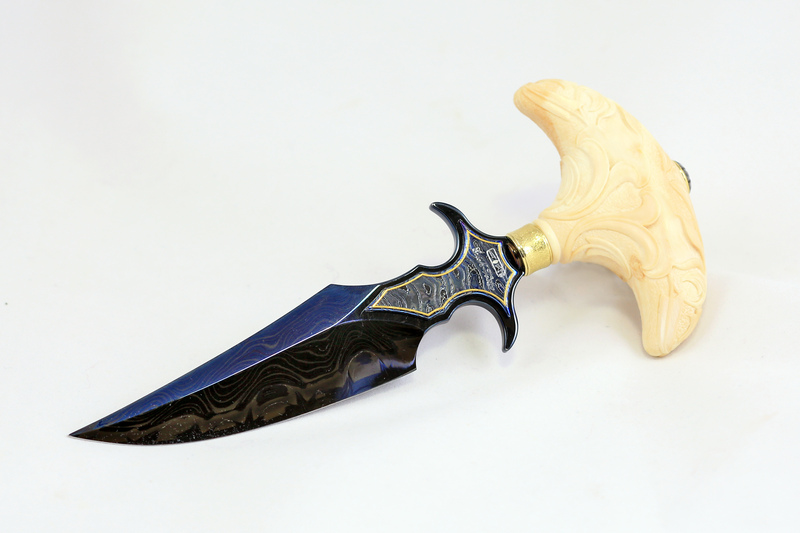 I met Kevin Harvey at Gold Reef City in 1999 and completed my first knife making course there. 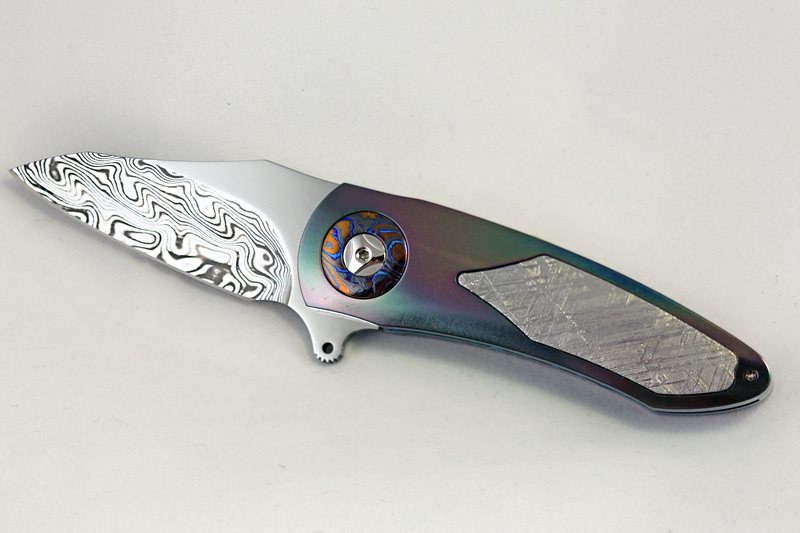 Subsequent courses with Andrè Thorburn and numerous visits to other knife makers shaped me in the art of knife making. During this time I also attended a jewellery making and gold smithing course. 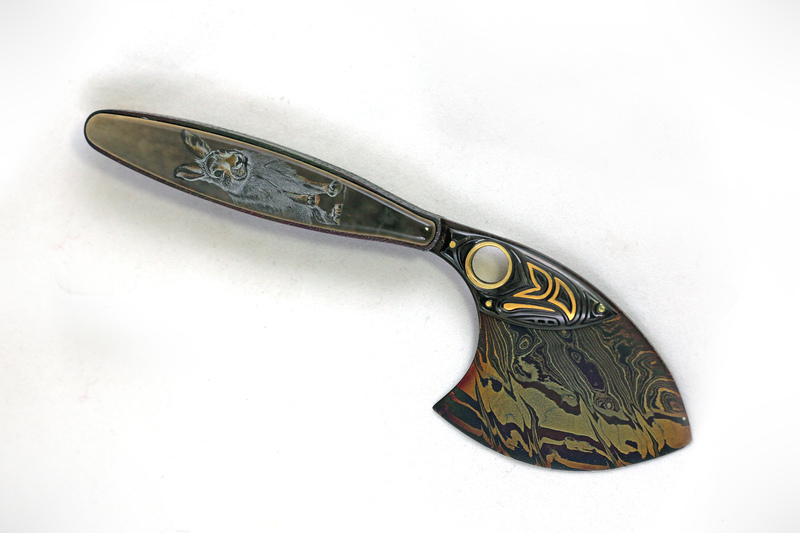 In 2002 I became a member of the Knife Makers Guild of Southern Africa. 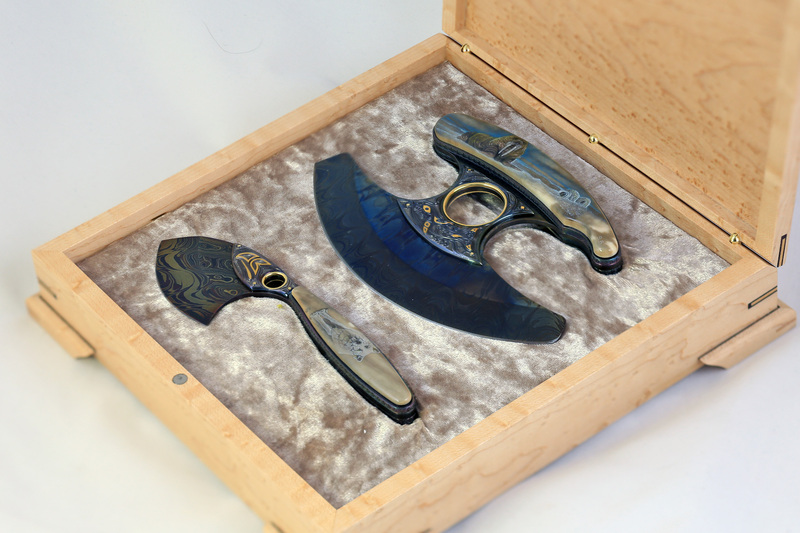 My true passion is to create elegant art and gentleman’s folders and knives. 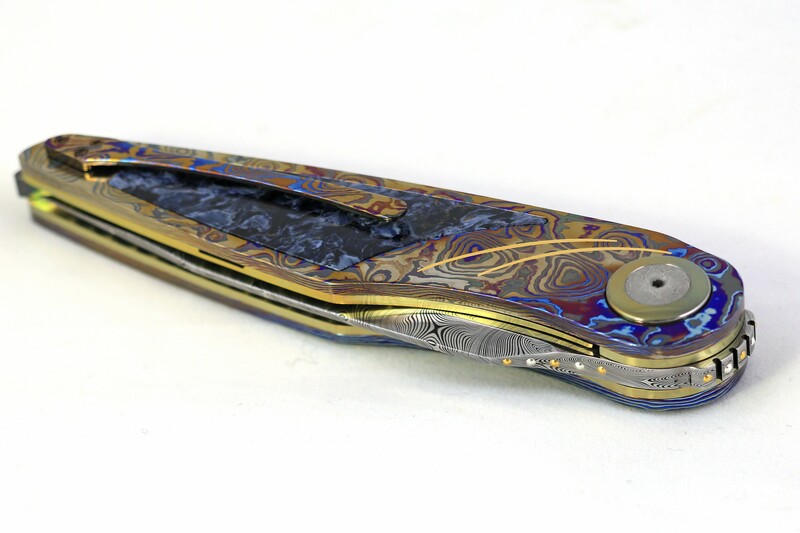 Most of them feature a variety of inlay materials like stone, meteorite and other exotic materials. I am now only making once off, never to be repeated unique knives and the folders all have an IKBS bearing system. 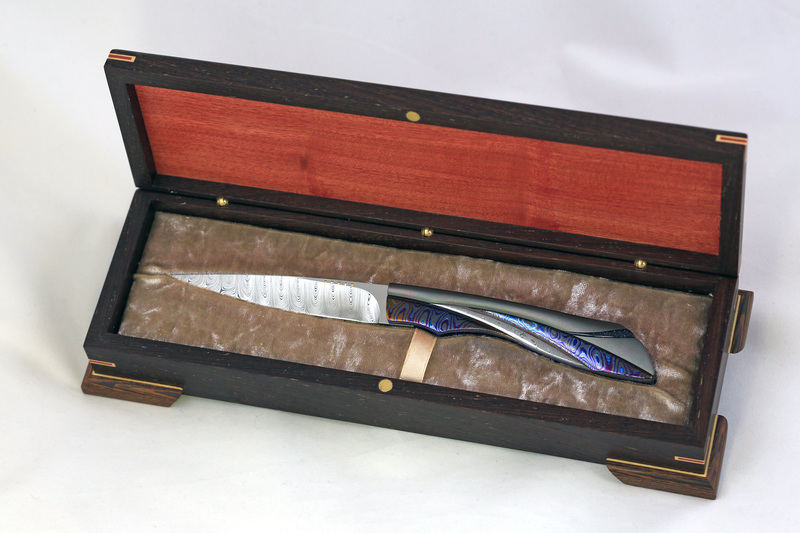 All my knives are presented and sold in boxes made from indigenous hard woods. These boxes are made by the master craftsman Brian Coetzee. A signed and dated certificate plaque of the features of the knife is placed in the lid of the box. Marianna, my lovely wife, a knowledgeable and stern critic of my work, inspects every knife in detail before it leaves the workshop. 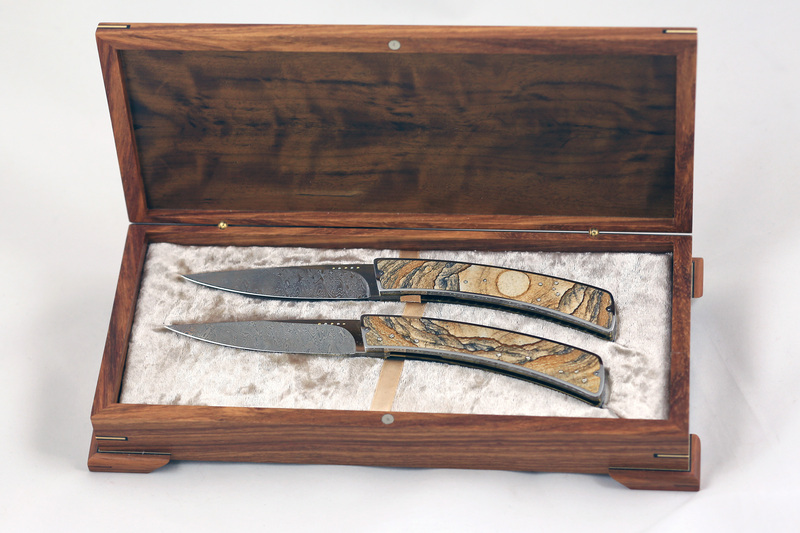 She also makes the inside cradles for the knives in the boxes and fits the plaques in the lids. Winner ‘Art Folder’ category 2018 annual KGSA Show. 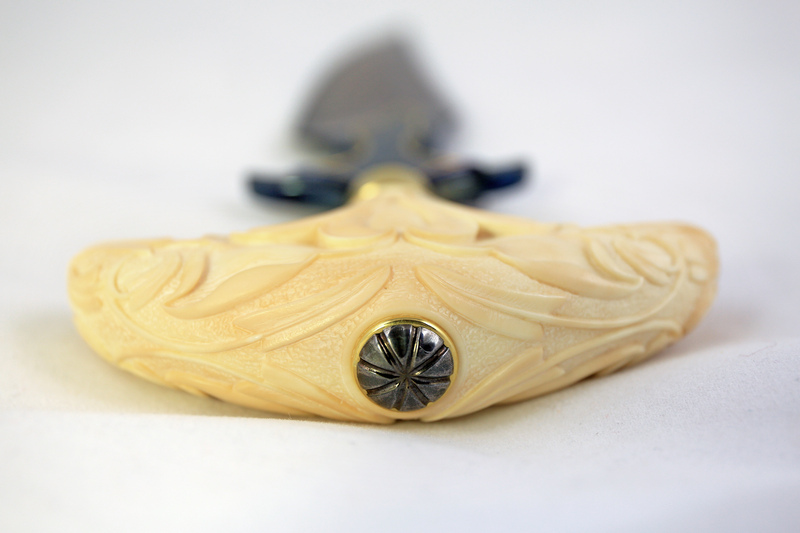 Damma steel blade with 24ct gold and silver opening beads. 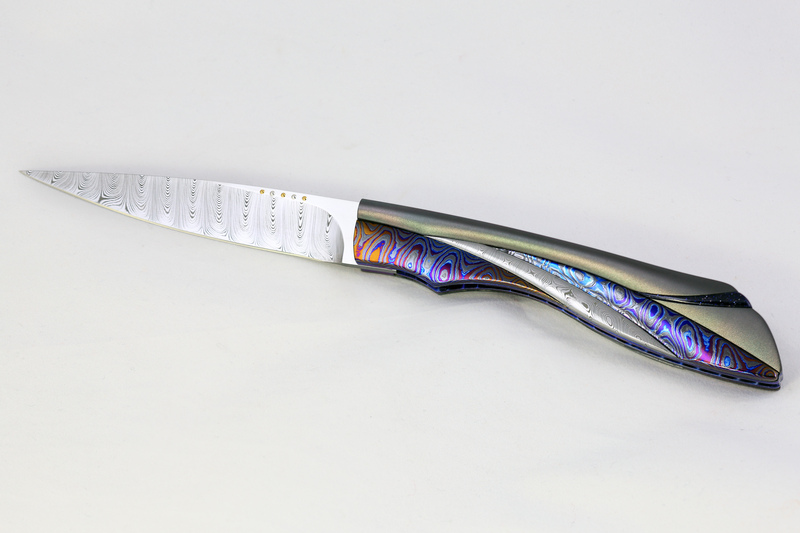 Bead blasted coloured zirconium handle with Midnight Sunstone inlays. Hand sculpted Zirco-Ti and Damma steel on lays. 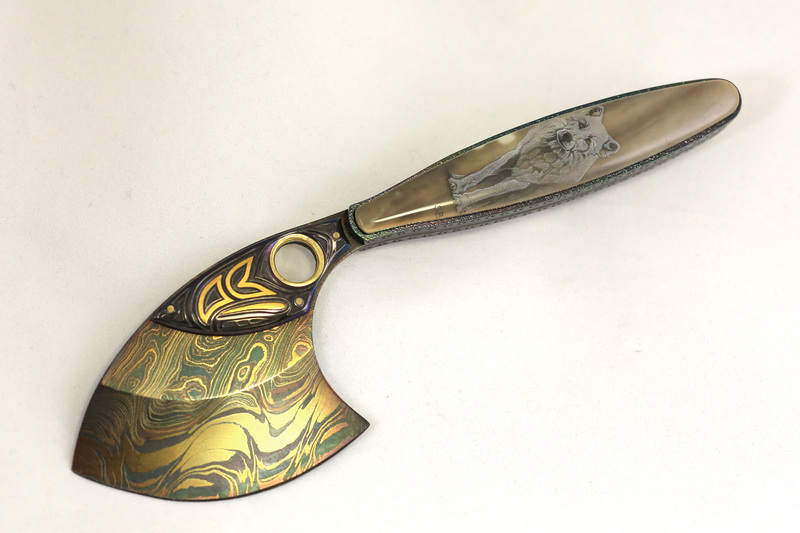 The Kevin Harvey Carbon steel Damascus blade on both sides feature Zirco-Ti inlays with a 24ct gold border. 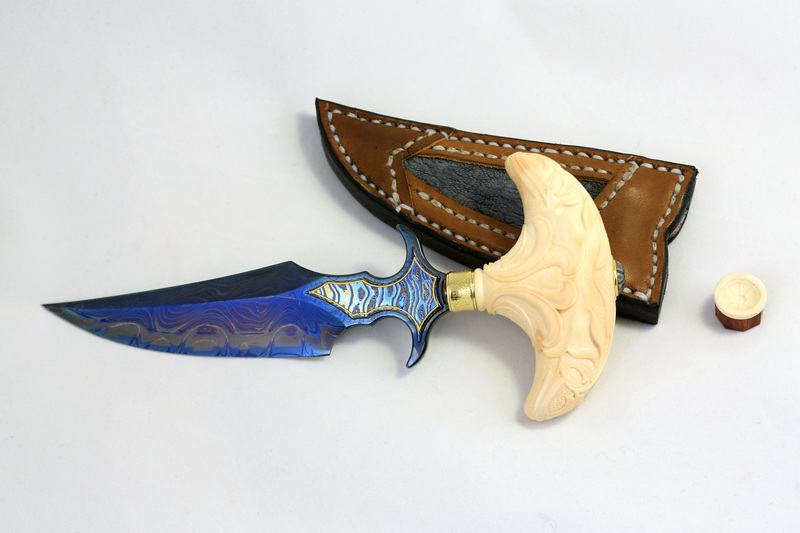 The handle is solid carved elephant ivory. The 24ct gold handle ring and the top handle nut was made by the maker. The small ivory nut driver was hand made to fit the handle nut for tightening or loosening it. 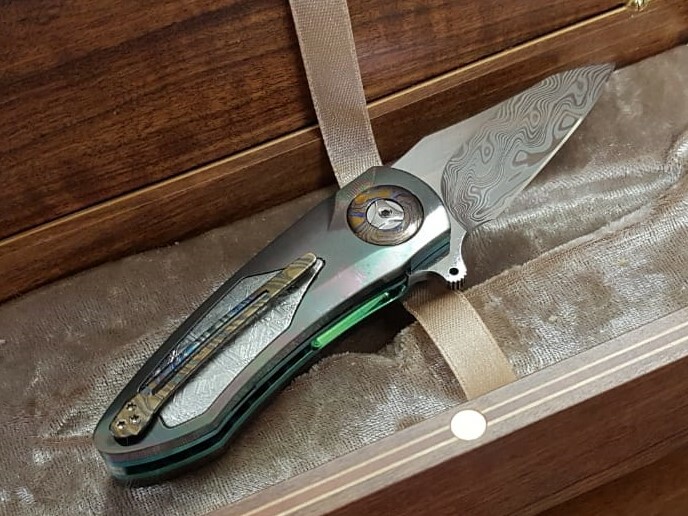 Winner ‘Best Knife of Show’ category 2018 KGSA Show. Winner ‘Gentleman’s Tactical Folder’ category 2018 KGSA Show. 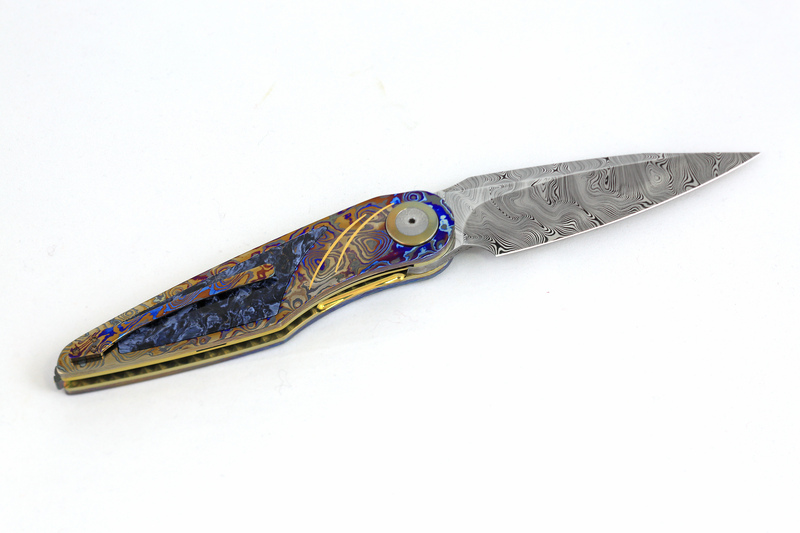 A colored Zirco-Ti handle with Pietersite Stone inlays. The Zirconium spacer has gold and silver beads at it's back end. Winner ‘Sets’ category 2018 KGSA Show. 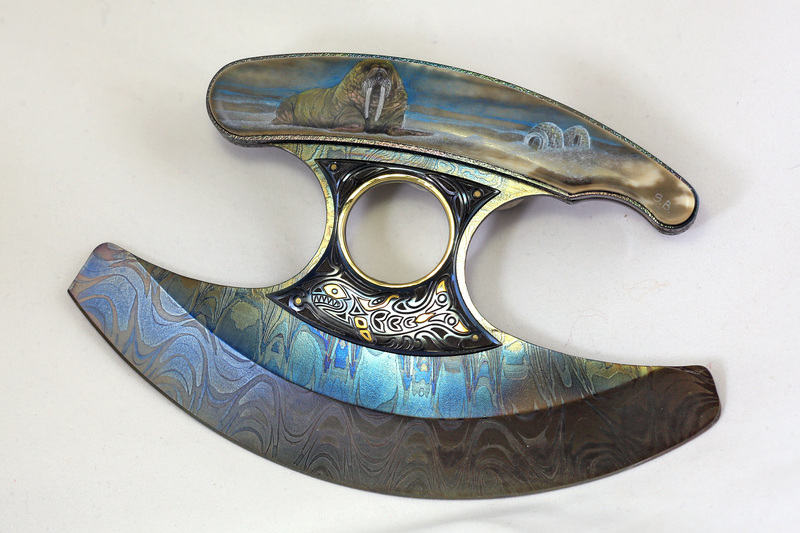 Blades: Blued Kevin Harvey Carbon steel Damascus. Blued engraved steel on lays and 18ct gold inner rings. 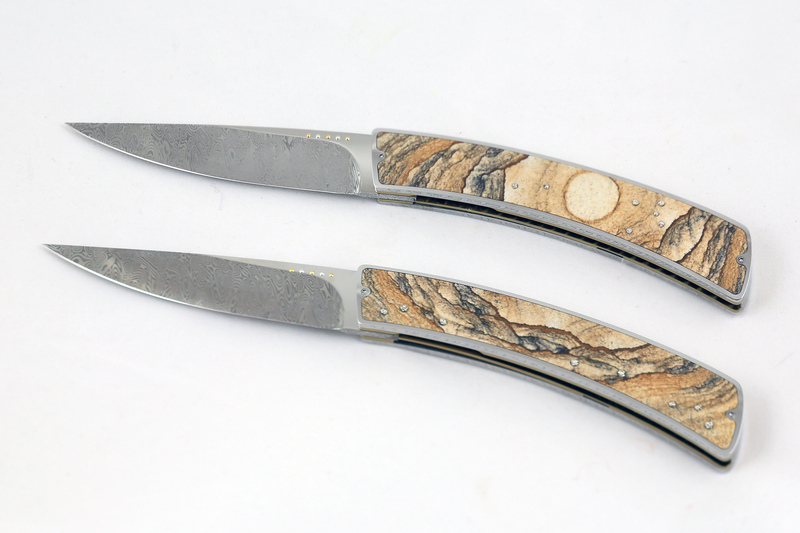 Handles: Zirconium handle holders with antique Walrus Ivory inlays. 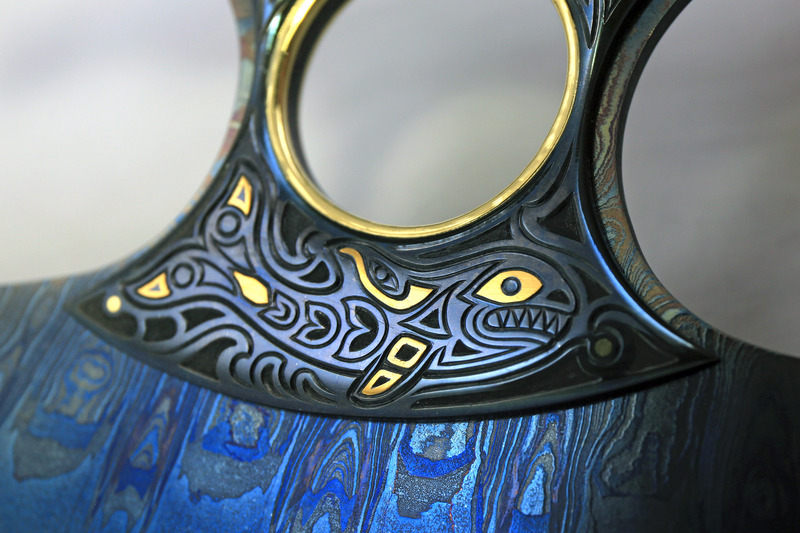 Engraving and gold inlay by Julien Marshal. 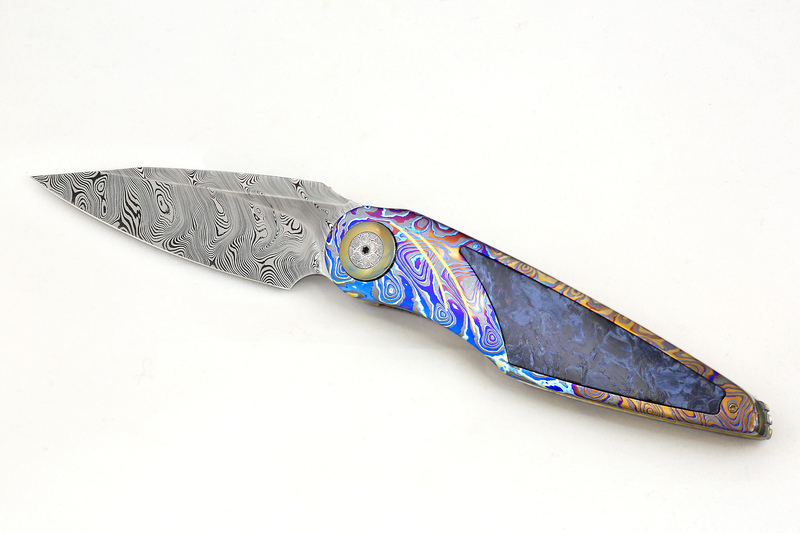 Blued Kevin Harvey Carbon steel Damascus blade. Blued engraved steel on lays with 18ct gold inner rings. Winner ‘Gentleman’s Folder’ category 2018 KGSA Show. Damma steel blade with opening beads. 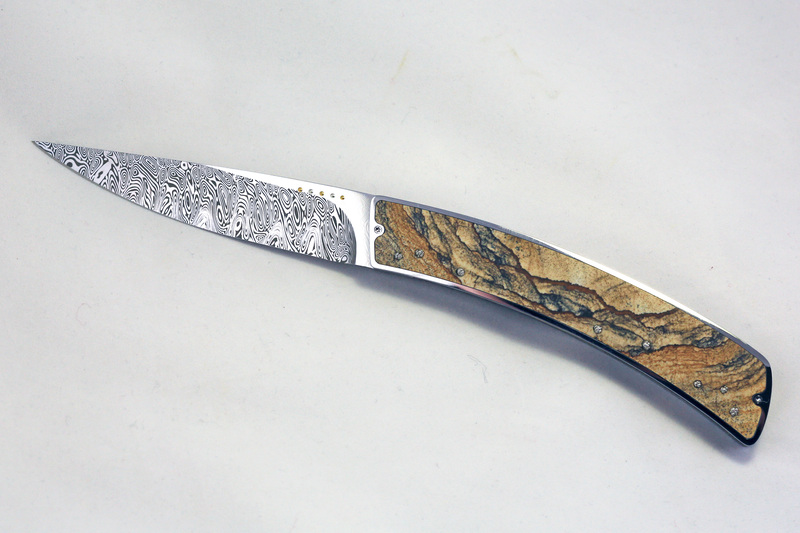 Stainless steel engraved handle frame with Namibian Picture Stone inlays. 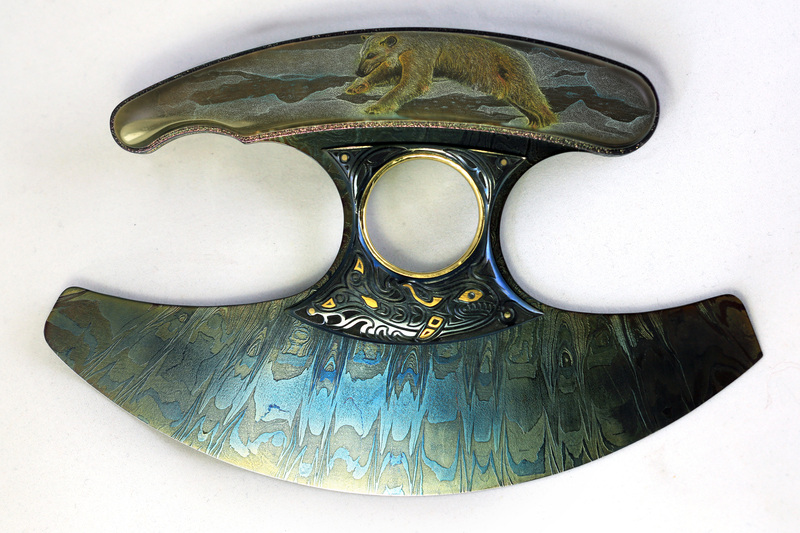 The Nickle clusters on the knife portray the Quiver Trees of the area. Blades: Damma steel with gold and silver opening beads. 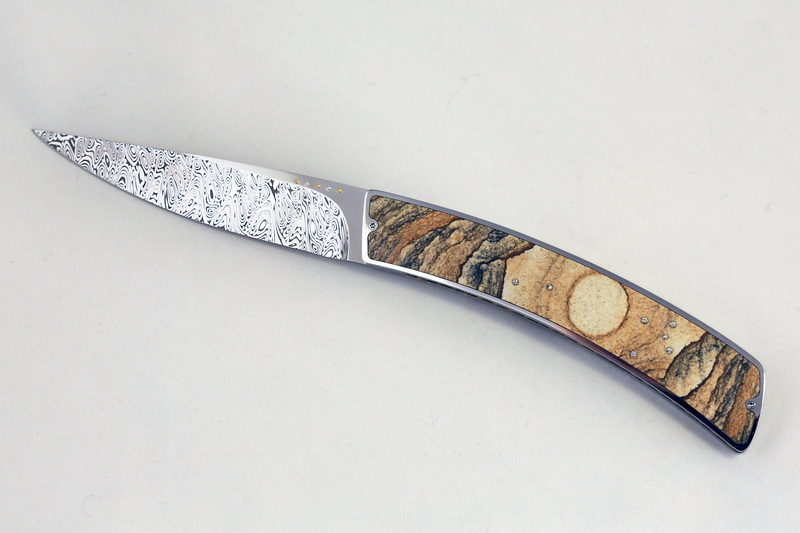 Upper Handle: Stainless Steel engraved frame with Namibian Picture Stone inlays portraying the Ai Ais landscape. The Nickle clusters set in the stone portray the Quiver Trees of the area. 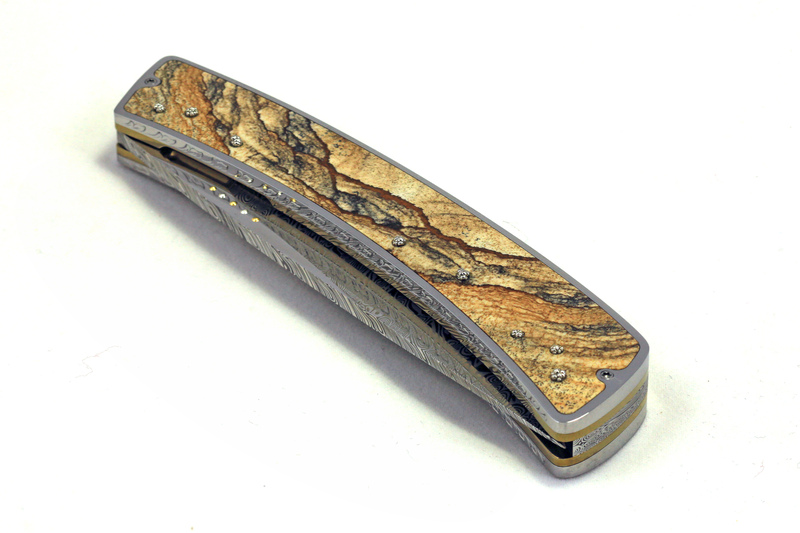 Lower Handle: Stainless Steel engraved frames with Namibian Picture Stone inlays portraying a Full Moon. The Nickle clusters set in the stone portray the Southern Cross star constellation with the two Pointers. 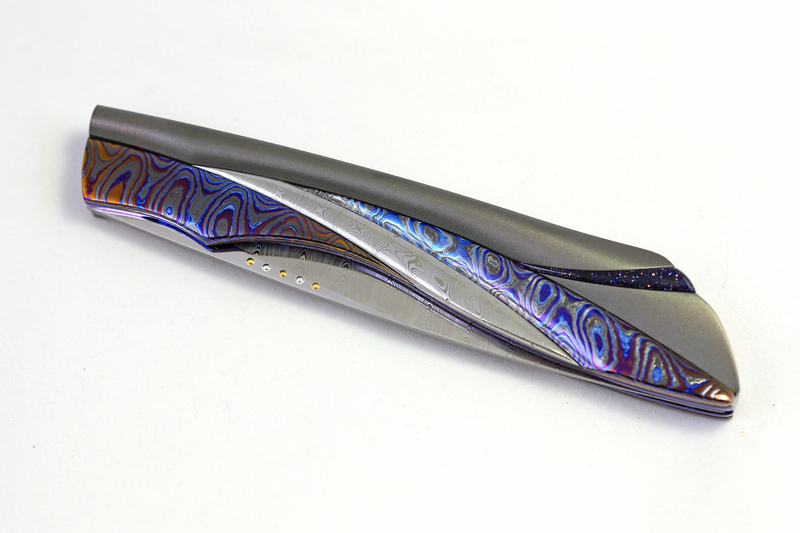 Zirconium handle with Gibeon meteorite inlays. Zirco-Ti Bezels and pocket clip.